Star Hill Solutions, Inc., a pioneer in introducing patented new products that solve vexing land management and material handling problems, is pleased to announce the addition of the patented Star Hill Quik Pik Grapple to its existing line of patented Star Hill Jawz Grabbing Tools. We invite you to take a tour of the Quik Pik website and see the wide range of material handling chores this multi-use grapple can handle. This truly innovative loader attachment offers interesting alternatives to how many jobs are now being performed. We hope you take the time to see for yourself. WHAT IS THE STAR HILL QUIK PIK? The patented Quik Pik, by virtue of it’s boom and tine dual actuated features, is a multi-use grapple unlike any other loader grapple on the market today. Boom and Tines: This feature is the heart and soul of the Quik Pik. The curved “fingers” allow just about any cylindrical object to be grasped securely. The boom/tine combo provides greater reach and material volume capacity than any other loader grapple on the market today. anything else a conventional forklift might handle. WHY IS THE QUIK PIK IMPORTANT? Never before has one attachment been able to perform such a wide range of field activities. 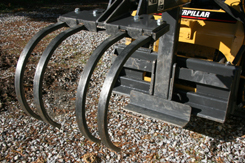 The unique geometry combined with the precise handling and clasping ability of the Quik Pik is of great benefit whether you are moving pallets, securing lumber, handling large hay bales, stacking large diameter logs, dealing with gnarly stumps and debris, moving wood chips and manure, placing culverts and pipes, setting large cut stone blocks and rocks, or dealing with large awkward and cumbersome objects. The Quik Pik greatly expands the range of things you can do with one attachment and certainly increases operator efficiency. HOW DO I BENEFIT FROM BUYING THE QUIK PIK GRABBING TOOL? 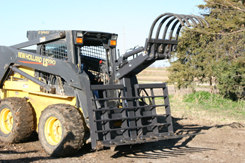 The Quik Pik, because it offers a multi-use grapple option, is a very economical loader attachment to have in your inventory. 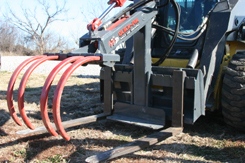 The multi-function Quik Pik Grapple with Landscape Shoe, Pallet Forks, and Brush Rake eliminates the need to have three different loader attachments. In addition to saving money on multiple attachments, this attachment will greatly simplify many field operations. Enhanced safety, saving time (and money) and increased operator satisfaction are additional benefits associated with the Quik Pik.Grabbing Tool. Expands the usefulness of your tractor/loader combination.